The 9th Infantry Division ("Old Reliables") is an inactive infantry division of the United States Army. It was created as the 9th Division during World War I, but never deployed overseas. In later years, it would become an important unit of the U.S. Army during World War II and the Vietnam War. It was also activated as a peacetime readiness unit from 1947 to 1962 at Fort Dix, New Jersey, and Fort Carson, Colorado, and from 1972 to 1991 as an active-duty infantry division at Fort Lewis, Washington. Nicknamed the "Old Reliables", the division was eventually inactivated in December 1991. The shoulder sleeve insignia is an octofoil resembling a heraldic design given to the ninth son of a family. This represents the son as a circle in the middle with eight brothers around him. The blue represents the infantry, the red the artillery with all the white making the colors of the flag of the United States of America. The 9th Infantry Division was created on 18 July 1918 at Camp Sheridan, Alabama but did not serve overseas. It was disbanded on 15 February 1919 at Camp Sheridan. Activated: 1 August 1940 at Fort Bragg, North Carolina. The 9th Infantry Division was among the first U.S. combat units to engage in offensive ground operations during World War II. (The others were the 32nd and the 41st in the Pacific on New Guinea, Carlson's Raiders on Makin Island, the 1st Marine, and the Americal on Guadalcanal, and, alongside the 9th in North Africa, were the 1st Infantry, 3rd Infantry and the 2nd Armored Divisions.) The 9th saw its first combat on 8 November 1942, when its elements landed at Algiers, Safi, and Port Lyautey, with the taking of Safi by the 3rd Battalion of the 47th Infantry Regiment standing as the first liberation of a city from Axis control in World War II. With the collapse of French resistance on 11 November 1942, the division patrolled the Spanish Moroccan border. The 9th returned to Tunisia in February and engaged in small defensive actions and patrol activity. On 28 March 1943 it launched an attack in southern Tunisia and fought its way north into Bizerte, 7 May. In August, the 9th landed at Palermo, Sicily, and took part in the capture of Randazzo and Messina. After returning to England for further training, the division landed on Utah Beach on 10 June 1944 (D plus 4), cut off the Cotentin Peninsula, drove on to Cherbourg and penetrated the port's heavy defenses. 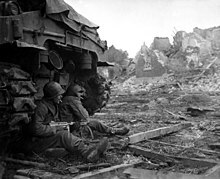 GIs of C Company, 36th Armored Infantry Regiment, 9th Infantry Division at Geich [de], Germany, 11 December 1944. After a brief rest in July, the division took part in the St. Lo break-through and in August helped close the Falaise Gap. Turning east, the 9th crossed the Marne, 28 August, swept through Saarlautern, and in November and December held defensive positions from Monschau to Losheim. Moving north to Bergrath, Germany, it launched an attack toward the Roer, 10 December, taking Echtz and Schlich. From mid-December through January 1945, the division held defensive positions from Kalterherberg to Elsenborn. On 30 January the division jumped off from Monschau in a drive across the Roer and to the Rhine, crossing at Remagen, 7 March. After breaking out of the Remagen bridgehead, the 9th assisted in the sealing and clearing of the Ruhr Pocket, then moved 150 miles (240 km) east to Nordhausen and attacked in the Harz Mountains, 14–20 April. On 21 April the Division relieved the 3d Armored Division along the Mulde River, near Dessau, and held that line until VE-day. The 9th Infantry Division was reactivated on 15 July 1947 at Fort Dix, New Jersey and assumed a peacetime readiness and training role. It was not deployed overseas during the Korean War. At some point, the division was moved to Fort Carson, Colorado where it was inactivated on 31 January 1962. During the war the division's units often served with the Mobile Riverine Force and other US Navy units that made up the Brown Water Navy. Its area of operations was in the rivers and canals of the Mekong Delta from 1967 to 1972. Operation Speedy Express was one significant operation in which the division took part during the war and was one of 22 major combat engagements with North Vietnamese Army and Viet Cong main force units as well as thousands of small contacts during this period during division's presence in Vietnam. Operating deep within the Viet Cong–controlled Delta, the 9th Infantry Division of the U.S. Army was charged with protecting the area and its population against Communist insurgents and ensuring the success of the South Vietnamese government’s pacification program. Faced with unrelenting physical hardships, a tenacious enemy, and the region’s rugged terrain, the 9th Division established strategies and quantifiable goals for completing their mission, effectively writing a blueprint for combating guerilla warfare that influenced army tacticians for decades to come. The 9th Division was reactivated on 1 February 1966, and arrived in Vietnam on 16 December 1966 from Fort Riley, Kansas, and its major units departed Vietnam on 27 August 1969 (HHC & 1st BDE) to Hawaii; 27 August 1969 (2nd BDE) to Fort Lewis, Washington; 12 October 1970 (3rd BDE) to Fort Lewis, Washington. On deployment the division was assigned to the III Corps Tactical Zone of Vietnam where it commenced operations in the Dinh Tuong and Long An provinces (6 January-31 May 1967) in Operation Palm Beach. Fire Support Base Danger, HHC, 4th Battalion, 39th Infantry, Dinh Tuong Province, March 1969. One of the experimental units serving with the division was the 39th Cavalry Platoon (Air Cushion Vehicle) which used three of the specially designed hovercraft to patrol marshy terrain like the Plain of Reeds along the south Vietnamese/Cambodian border. Other experimental units were the 1st and 2nd Airboat Platoons, which operated Hurricane Aircat airboats. Mỹ Tho, Vietnam. 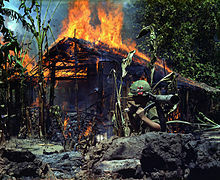 A Viet Cong base camp being burned down. From 1967 on, one of the division's brigades (the 2d Brigade) was the Army contingent of the Mobile Riverine Force. This brigade lived on the ships of Navy Task Force 117, and were transported on their infantry missions throughout the Mekong Delta on Tango boats (converted World War II landing craft) supported by various other armored boats some of which mounted flame-throwers (called zippo after the lighter); had mortars in their holds; and even 105mm cannons on their bows (called monitors). The mobile riverine force was often anchored near the South Vietnamese city of Mỹ Tho, or near the Division's Đồng Tâm Base Camp, and they conducted operations in coordination with the Navy SEAL teams, the South Vietnamese Marines, units of the ARVN 7th Division and River Assault Groups. Following the Tet offensive in 1968, General Westmoreland stated that the 9th Infantry Division and the Mobile Riverine Force saved the Delta region from falling to the North Vietnamese Army forces. In 1969, the division also operated throughout the IV Corps Tactical Zone. One of the ships assigned to the Mobile Riverine Force was the Benewah. Chuck Hagel, former Secretary of Defense, served in the 9th ID from 1967 to 1968. Holding the rank of Sergeant (E-5), he served as an infantry squad leader. Hagel served in the same infantry squad as his younger brother Tom, and they are believed to be the only American siblings to do so during the Vietnam War. In the 1994 film Forrest Gump, the eponymous main character was a member of the 9th Infantry Division in Vietnam, notably: 4th Platoon, Company A, 2nd Battalion, 47th Infantry. Following the Vietnam War the division was stationed at Fort Lewis Washington until its inactivation in 1992. Beginning in the mid-1980s the division served as the high-technology test-bed for the army. This led to the division testing the concept of "motorized infantry", designed to fill the gap between light infantry and heavy mechanized forces. The idea was to create lighter, mobile units capable of rapid deployment with far less aircraft than a heavier mechanized unit. Motorized infantry doctrine concentrated on effectiveness in desert warfare. U.S. Navy SEALs operate Desert Patrol Vehicles (DPV), the successor to the Fast Attack Vehicle pioneered by the 9th ID (Motorized). By 1989 the division had fielded two complete brigades of motorized infantry in battalions designated as "light attack," "light combined arms" and "heavy combined arms". Motorized battalions traveled in the new Humvee and generally fought as traditional light infantry once engaged. Attack battalions utilized the Fast Attack Vehicles (later re-designated the Desert Patrol Vehicle), first developed at Fort Lewis. Essentially a Volkswagen-engined dune buggy mounted with either a 40mm Mk 19 grenade launcher or .50 caliber M2 Browning machine gun, the FAV was designed to provide highly mobile firepower that could attack the flanks of heavier mechanized units. Some variants also mounted TOW missiles. All of these weapons systems were attached to the FAV by a mount designed to break away if the vehicle rolled over, which they were prone to do. The FAVs were problematic at best and were eventually replaced by various versions of the Humvee/HMMWV light truck. The 9th Infantry Division (MTZ) tested motorized infantry doctrine at the Yakima Firing Center in Eastern Washington, at the National Training Center at Fort Irwin California and in Korea during the annual Team Spirit exercise. While the motorized units performed well they were vulnerable to heavier mechanized forces, particularly if forced to stand and fight. They were also extremely vulnerable to indirect (artillery) fires. At the end of the Cold War the division was identified for inactivation. By the time of the First Gulf War one brigade was nearly inactivated. However the 3rd Brigade was still at full strength. The need for mobile forces that could be more easily deployed would seem to have never been greater. However the brigade was not deployed to the Middle East, instead providing soldiers and equipment to fill out deploying units from other divisions. The division was the first to undergo full inactivation following the end of the Cold War. Army leadership at first decided that inactivating units would turn in all of their equipment at "10/20" standard – in ready and reusable condition. The division struggled to meet this standard. It required both extensive work on the part of the division's soldiers and high costs in repair parts. While the remaining 9th ID soldiers were ultimately successful, later inactivating units were not required to attain this goal. The existing 3rd Brigade did not deactivate and was instead designated a light infantry brigade under the operational control of the 25th Infantry Division (United States). Though it was inactivated, the division was identified as the second highest priority inactive division in the United States Army Center of Military History's lineage scheme due to its numerous accolades and long history. All of the division's flags and heraldic items were moved to the National Infantry Museum at Fort Benning, Georgia following its inactivation. Should the U.S. Army decide to activate more divisions in the future, the center will most likely suggest the first new division be the 9th Infantry Division, then the 24th Infantry Division, the 5th Infantry Division, and the 2nd Armored Division. The 7th Infantry Division, previously inactivated, resumed service as an administrative headquarters at Joint Base Lewis–McChord in 2012. ^ Carr, Bill (2013). WWII First Army Code Book. Raleigh, NC: Lulu.com. p. 171. ISBN 978-1-304-48803-9. ^ J. E. Kaufmann; H. W. Kaufmann (22 September 2009). The American GI in Europe in World War II: The March to D-Day. Stackpole Books. p. 277. ISBN 978-0-8117-4373-0. Picken, Jack L. (1991). Summary Histories: World War II Regular Army Infantry and Cavalry Divisions. St. Augustine, Florida: Florida Department of Military Affairs. p. 55. OCLC 6706906. ^ "9th Infantry Division categories". 9thinfdivsociety.org. 15 July 1947. Retrieved 22 August 2013. ^ Video: American Sub Rescues Airmen (1944). Universal Newsreel. 1944. Retrieved 21 February 2012. ^ "Hitler's Nemesis: The 9th Infantry Division – WWII G.I. Stories Booklet". Lone Sentry. Retrieved 22 August 2013. ^ Hunt Jr, Ira "The 9th Infantry Division In Vietnam" 2010. Retrieved on 18th July 2016. ^ Stanton, Shelby L. (2003). Vietnam Order of Battle. Stackpole Books. pp. 134, 331. ^ Wollner, James Parker (2007). The Bamboo Shoot. Bloomington, Indiana: Xlibris Corporation. p. 46. ISBN 978-1-4134-5338-6. ^ Fowler, Carol; Bilby, Joseph (14 June 2001). "James P. Wollner Veteran Oral History". Militia Museum of New Jersey. New Jersey. Retrieved 16 September 2018. ^ McIlhaney, Bruce (17 May 2006). "From the S&S archives: Airboats in Vietnam, 1968". Stars and Stripes. Retrieved 16 September 2018. ^ John Darrell Sherwood (31 January 2018). "Defending the Mekong Delta: Tet and the Legacy of the Brown-Water Navy". War on the Rocks. Retrieved 16 March 2019. ^ Major General William B. Fulton (15 August 2014). Vietnam Studies - RIVERINE OPERATIONS 1966-1969 [Illustrated Edition]. Normanby Press. p. 168. ISBN 978-1-78289-364-6. ^ Experiencing War, Stories from the Veterans History Project, Charles Timothy Hagel, Library of Congress, accessed 12 December 2012. ^ "The private war of Chuck and Tom Hagel" by Myra MacPherson, Salon, 30 April 2007. ^ "Forrest Gump (1994)". Retrieved 6 April 2018 – via www.imdb.com. ^ Trevithick, Joe (22 August 2016). "The U.S. Army had a whole battalion of armed dune buggies". War is Boring. Retrieved 23 August 2016 – via We are The Mighty.com. McKenney, Janice (1997). Reflagging the Army. United States Army Center of Military History. ASIN B0006QRJPC. 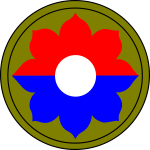 Wikimedia Commons has media related to 9th Infantry Division (United States). This page was last edited on 6 April 2019, at 04:52 (UTC).